She keeps me there for some time beside her, telling me about the Etruscans. I tell her the Romans believed the Etruscans were particularly skilled at divination, and she tells me that this land is still charmed, still delivering oracles, and that she waits here by the waterfall to receive them. She wants to draw parallels between the Etruscan cities and the American Indian tribes, between colonization carried out by the Romans and that carried out by European settlers to the Americas, and because I think she’s a little odd, I don’t say much to the contrary. But she does get me thinking, and as I spend hours searching through the park, trying to reconstruct her directions, I wonder about how the Romans remembered their legendary enemies. I wander through several miles of wheat fields, a buried city leased out to local farmers. Every once in a while the remains of a structure break the surface of the fields, and the grass grows tall to ward off tractors and reapers. When I finally reach the citadel, loosely marked “gli scavi,” it is late in the afternoon. 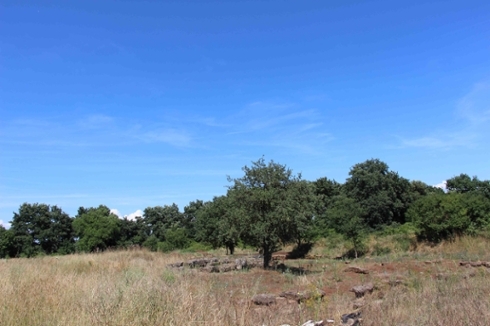 I have come here because this is the site of Veii’s downfall, and the heart of its legendary connection to Rome. After 300 years of intermittent conflict, Livy tells us, Rome finally conquered Veii. Having dug a tunnel from the city walls to the citadel, the Roman victors emerged into the city: “Such was the fall of Veii, the most wealthy city of the Etruscan league, showing its greatness even in its final overthrow, since after being besieged for ten summers and winters and inflicting more loss than it sustained, it succumbed at last to destiny, being after all carried by a mine and not by direct assault” (5.22). The Romans took everything, even the votive statue to Juno. Legend goes that they asked her whether she would like to come to Rome, and when she nodded, they carried her to Rome and commenced building a new temple to Juno on the Aventine hill. Neither temple, in Rome or Veii, still remains. But standing atop the Aventine in the gardens of the Chiesa di Santa Sabina, beneath which lie the remains the temple to Juno Aventino, I look North toward her former home, the renowned city that the Romans remembered as the one they couldn’t beat, the one destiny and cunning had to hand them. They remembered them as the people who understood the oracles and amassed great wealth, as the political force from whom they derived their own symbols of power--the toga and the curule seat, and the license of divine Juno. Home again now, I’m experiencing a whole different kind of distance, one that makes me feel so far from ancient Rome I wonder if I’m even working on the same project. Sitting behind my laptop all day, perusing Stack Overflow to try to understand AJAX calls (that acronym is as close as I’ll get to the ancient Mediterranean for a while), it’s hard to tie it all together. 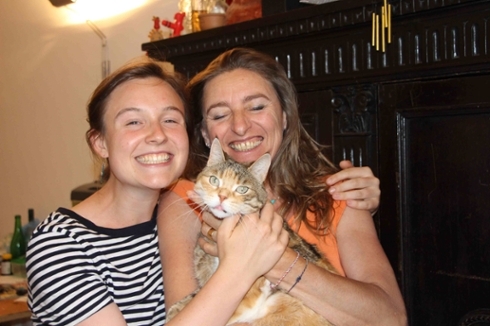 And I miss Francesca, my host who became my friend, and her cat, gatta Mimma. But I keep telling myself it’s all going to be okay, that things will come together when I integrate the technological infrastructure I’ve been building with the content I gathered abroad. And that a sense of alienation can come in so many different forms, and that getting through it, and building oneself into a new community, always takes work. It takes learning a new language, and it takes meeting new people. It takes respect and skepticism, immersion and distance. More to come.